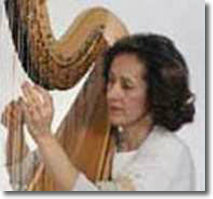 Dr. Erzsébet Gaál, harpist, Bloomington, IN, U.S.A. Professor Dr. Géza Kovács's classes played a crucial role in myearly harp career. I taught me to understand the uniqueness of a musician's lifestyle and to manage a career with a proper lifestyle succesfully and happily. The knowledge that I gained and put into practice during the ten years of participation in this pedagogical program became an everyday routine in my private and professional life. The particular information that this program offers cannot be obtained from any other source. This is the only place where musicians can learn how to be prepared physically, mentally, and spiritually to meet the demands of their profession and maintain a high level of physical and mental wellness. I can say this after completing a research project among harpists in 47 countries of the world, and studying the litarature of physical wellness for musicians for an additional ten years. For moreinformation on this subject, please refer to the following articles. Gaál, E. (1997). Physical Fitness Program for Musicians. Harpa-Piano, 1 (Spring), 48-49. Gaál, E. (1998). Harpists' Health and Fitness. The American Harp Journal, 16 (Summer), 31-34.